The Club offers a varied programme of social events including many interesting and informative talks from visiting professionals, practical demonstrations and quizzes, supported by an excellent bar. The FSC clubhouse is an excellent location to relax and make friends. As a visitor friendly club, non-members are invited to share our facilities on Tuesday evening throughout the year, and during Saturday afternoon racing throughout the season. The clubhouse is open every Tuesday evening throughout the winter except for a short period over Christmas and New Year, with an extensive and diverse programme of talks and events. A fully stocked bar is available serving local ales. 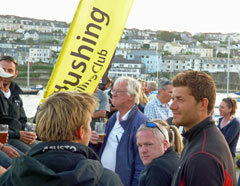 Sailing suppers are available throughout the evening sailing season with wholesome menus provided by our caterers. Afternoon teas are provided on Saturdays. The catering is provided by members who volunteer to bake and serve. The tea rota may be downloaded here. There is also a handy how to, which explains what to do and where things are in the kitchen. The Club has WiFi which is available to all. Just ask for the password, which will also be found in the Members' Area. The Password to the Members' Area is circulated to all members when they join or renew their membership. If you have lost either password, Contact Us to request the details.